The innate immune system utilizes many approaches for defense against invading microorganisms, including complement-mediated lysis, engulfment, formation of neutrophil extracellular traps, and release of antimicrobial peptides. Although classically thought to be driven by adaptive immunity, the development of autoimmune diseases such as rheumatoid arthritis and systemic lupus erythematosus is increasingly associated with dysregulated innate immune pathways. An emerging theme within this literature is the contribution of antimicrobial peptides to the development of autoimmune disorders. This is best exemplified in atopic dermatitis and psoriasis where the defensins and the single human cathelicidin, LL-37, may contribute to disease. Furthermore, in the past few years, a role for LL-37 has emerged in the pathogenesis of systemic lupus erythematosus, rheumatoid arthritis, atherosclerosis, and possibly other diseases. 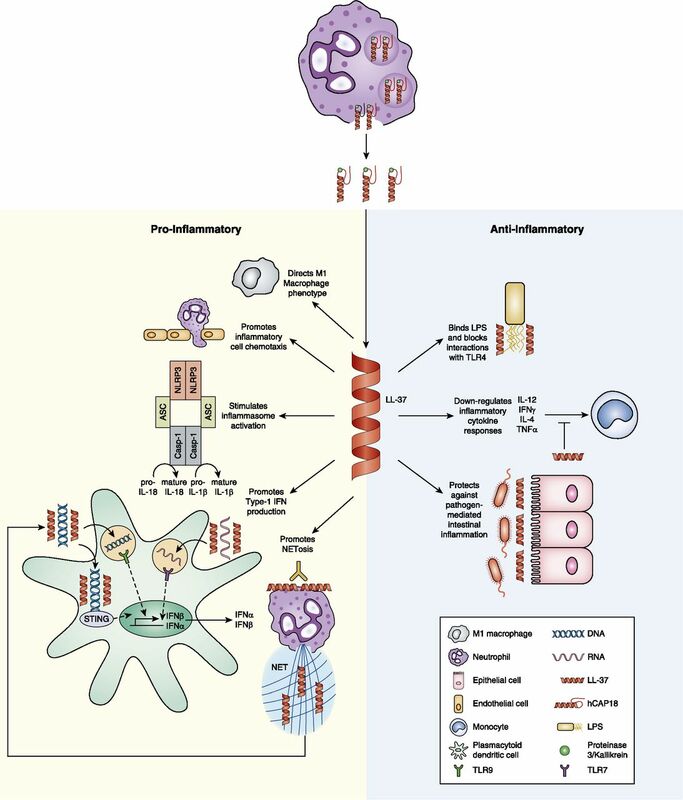 In this review, we discuss the role of LL-37 and its murine ortholog, mCRAMP, in the modulation of immune and inflammatory pathways and their effects on autoimmune and inflammatory diseases. The innate immune system plays a crucial role in defense against microbes as well as in the initiation of inflammatory responses. Antimicrobial peptides (AMPs) are an important evolutionarily conserved defense mechanism against bacterial and fungal invasion of eukaryotic organisms. Hundreds of AMPs are synthesized by epithelial cells and lymphocytes (1). Although several classes of AMPs exist, LL-37 is the sole member of the human cathelicidin family. This peptide has piqued the interest of the research community because, in addition to its antimicrobial properties, it carries numerous immune system–modulating properties that may contribute to autoimmune disease development (Table I). LL-37 is a 37-aa cationic peptide generated by extracellular cleavage of the C-terminal end of the 18-kDa hCAP18 protein by serine proteases of the kallikrein family in keratinocytes (12, 13) and proteinase 3 in neutrophils (14) (Fig. 1). LL-37 is able to form aggregates in solution and lipid bilayers and thus, unlike other antimicrobial peptides, is protected from proteolytic degradation (15). Its positive charge allows it to preferentially associate with negatively charged phospholipid membranes (15). Furthermore, it assumes a primarily α helical shape during membrane interactions resulting in unilateral segregation of its hydrophobic residues (16). This allows for membrane penetration, formation of transmembrane pores, and bacterial lysis (16–18). Cellular membranes associated with cholesterol, such as those found in mammals, are protected from the pore-forming effects of LL-37; however, this effect can be overcome by higher concentrations of the peptide (19, 20). LL-37 is generated via cleavage of full-length hCAP18 and has numerous immunomodulatory functions depending on environmental and cellular contexts. The 18-kDa propeptide hCAP18 is synthesized and stored in granules and lamellar bodies. Following stimulation by proinflammatory signals, hCAP18 is released into the extracellular environment and cleaved by proteinase 3 in neutrophils and kallikrein in keratinocytes (green dots) and the N-terminal 37 aa form the α helical LL-37 peptide that then dimerizes and trimerizes in solution. Exposure to LL-37 results in recruitment of inflammatory cells, induction of M1 macrophages, and stimulation of inflammatory responses such as inflammasome activation and type I IFN production. Type I IFN production is promoted via LL-37 protection of both RNA and DNA, allowing for activation of endosomal TLR7 and TLR9, respectively. LL-37, expressed on the surface of neutrophils, is recognized by anti–LL-37 autoantibodies, which promotes NETosis, generating a source of additional LL-37 DNA complexes. However, LL-37 has strong anti-inflammatory effects such as neutralization of TLR4 activation by LPS, downmodulation of inflammatory cytokine responses, and preventing invasion and inflammatory responses to pathogenic bacteria. LL-37 was originally characterized as constitutively expressed in secondary neutrophilic granules (12), However, LL-37 is produced by many cell types, including macrophages, NK cells, and epithelial cells of the skin, airways, ocular surface, and intestine (20). Regulation of its expression is controlled by inflammatory pathways as well as the vitamin D pathway and endoplasmic reticulum stress (21–23). Studies utilizing mice deficient in mCRAMP, the murine ortholog of LL-37, have demonstrated important antimicrobial roles for this peptide. In the skin, LL-37/mCRAMP is required to prevent invasive bacterial infections (24). Similarly, mice deficient in mCRAMP have increased colonization and invasion of pathogenic bacteria in the colon (25) and are more susceptible to urinary tract infections (26). Furthermore, mCRAMP displays protective effects against Clostridium difficile toxin-mediated colonic and ileal damage, whereas human LL-37 has protective functions on toxin A–mediated inflammatory cytokine production (27). Intriguingly, mCRAMP has also been shown to have protective effects against influenza infection, suggesting it also has a role in the antiviral response (28). Besides its antimicrobial functions, LL-37 also has immunomodulatory roles (Fig. 1). Indeed, both pro- and anti-inflammatory functions have been assigned to LL-37 and this may be modulated by the microenvironment and disease background. For example, the presence of 10 μg/ml LL-37 during monocyte-to-macrophage differentiation promotes a proinflammatory response, resulting in downregulation of IL-10 and upregulation of IL-12p40. Furthermore, LL-37 directs the plasticity of differentiated macrophages toward an M1 phenotype (29), suggesting that the presence of this peptide has a strong influence on macrophage development and cytokine production. Additionally, LL-37 exposure enhances inflammatory cytokine production driven by IL-1β signaling (30). Anti-inflammatory properties of LL-37 are demonstrated by its antagonistic action on IFN-γ, TNF-α, IL-4, and IL-12 responses in various cell types (30–32). A strong anti-inflammatory response through modulation of TLR signaling is also attributed to LL-37 (see below). Thus, the environmental and cellular context in which exposure to LL-37 occurs is important for determining the direction of the cellular response. A notable feature of LL-37 is that it also has various chemotactic properties. Acting through formyl peptide receptor 2, LL-37 induces migration of neutrophils and eosinophils (33). Other G protein–coupled receptors are similarly activated by LL-37 and may contribute to the chemotactic effects of this peptide (20). Transactivation of the epidermal growth factor receptor by LL-37 induces migration of keratinocytes and thus promotes wound healing (34). LL-37 also modulates the production of chemokines to promote chemotaxis. LL-37 is able to induce transcription of CXCL8 alone and synergizes with TNF-α–mediated expression of this chemokine (32). MCP-1/CCL-2, a monocyte recruitment factor, is secreted in a dose-dependent fashion following LL-37 stimulation (35). Furthermore, TGF-β released from intestinal epithelial cells following exposure to LL-37 also has important chemotactic effects for epithelial cell migration and the wound healing response (36). Thus, LL-37 released at the site of infection or tissue injury is able to promote the inflammatory response and initiate wound repair. TLRs are widely expressed receptors that respond to pathogen-associated molecular patterns. Dysregulation of TLR signaling has been reported to be important for the development of autoimmunity (37). Modulation of TLR function by LL-37 can be considered an anti-inflammatory effect. Indeed, LL-37 downregulates signaling through TLR4 via binding of its ligand, LPS (12, 38), as well as through interruption of TLR4 receptor complex function in dendritic cells (DCs) and macrophages (39, 40). This results in lower levels of proinflammatory cytokine production when LL-37 and LPS are present simultaneously. Similar repression of chemokine release has been noted in epithelial cell lines (35). In vivo, mCRAMP represses the response to 2,4-dinitrofluorobenzene–mediated contact hypersensitivity through pathways that require the TLR4 receptor (39). Alternatively, depending on the sequence of LL-37 and LPS exposure, the effects of LL-37 on TLR4 responses can be proinflammatory. When macrophages are primed with LPS prior to LL-37 exposure, there is enhanced release of TNF-α (35). Furthermore, LPS priming of monocytes and macrophages allows for activation of the inflammasome and IL-1β and IL-18 production following LL-37 stimulation (5, 41). In vivo, endogenous mCRAMP does not protect from LPS systemic effects, as both wild-type and mCRAMP−/− mice have similar rates of death in response to LPS-induced shock (43). Thus, the ability of LL-37 to have a suppressive effect on LPS effects depends on the timing and context within which cells are exposed. Other TLR effects are also modulated by LL-37 exposure. LL-37 stabilizes TLR3 ligands and is able to enhance viral responses transmitted via this receptor in TLR3-transfected bronchial epithelial cells (43). In contrast, there is modulation of TLR3 responses in keratinocytes leading to repression of polyinosinic-polycytidylic acid–mediated upregulation of CXCL10 and CCL5 but enhancement of polyinosinic-polycytidylic acid–induced CXCL8 (32). Flagellin activation of TLR5 is enhanced via LL-37 activation of src family kinases (44). These observations again support the concept that LL-37 can enhance or abrogate inflammatory signals depending on cell type and the microenvironment. Type I IFNs are an important part of the innate immune response to microbes. They promote myeloid DC maturation and activation of lymphocytes and NK cells (45). Type I IFNs are also elevated in many autoimmune diseases such as lupus, dermatomyositis, and psoriasis and likely contribute to disease pathogenesis (46). Synthesis of type I IFNs by plasmacytoid DCs (pDCs) occurs via endosomal recognition of pathogen-derived nucleic acids by TLR7 and TLR9. Cytosolic DNA receptor activation by nucleic acids also results in type I IFN synthesis in other cell types (47). Activation of these pathways by self-DNA is prevented by degradation and inhibition of uptake. The effects of LL-37 on type I IFN synthesis pathways are secondary to its positive charge and structure. Because of its high affinity for nucleic acids, LL-37 is able to bind DNA and act as a shuttle across membranes for nucleic acid delivery (48). In pDCs, DNA coupled with LL-37 (10 μM) promotes access to the endosomal compartment, pDC maturation, and TLR9 activation, thereby increasing type I IFN production. Furthermore, LL-37 enhances dsDNA uptake by monocytes resulting in TLR-independent cytoplasmic DNA sensing via STING and TBK1 kinase–mediated pathways leading to type I IFN production (49). Myeloid DCs also are able to take up extracellular DNA in the presence of LL-37, although less efficiently than pDCs or monocytes (49). Thus, the interactions of LL-37 with DNA may promote loss of tolerance to DNA and type I IFN synthesis, which may lead to aberrant immune responses following DNA exposure. Similar mechanisms of type I IFN induction have been demonstrated for LL-37 complexed with self-RNA released from dying cells, which stimulates TLR7-mediated IFN-α production in pDCs (50). Activation of the P2X7R, a robust inducer of inflammasome activation in macrophages and monocytes, is considered a unique function of LL-37. This stimulation results in activation of both IL-1β and IL-18 (5, 41). Furthermore, stimulation of this receptor by LL-37 enhances COX2 expression and PGE2 production via ERK and c-Jun-N-terminal kinase in human gingival fibroblasts (51). Stimulation of IL-8 and CXCL3 release via activation of Src family kinase pathways downstream of P2X7R activation has been described in keratinocytes (44). Activation of the insulin-like growth factor 1 receptor, resulting in activation of the MAPK/ERK pathway by LL-37, has also been reported (52). The effects of LL-37 on cell death regulation may be dependent on the cell type involved and the context in which the stimulation occurs. Activation of caspase-3 and caspase-8 and induction of apoptosis in neutrophils are inhibited by LL-37 (31). Higher doses of this peptide induce necrotic cell death in neutrophils, possibly secondary to overcoming inhibitory effects of membrane cholesterol on LL-37 pore-forming abilities. Epithelial cells such as keratinocytes are also protected from camptothecin-induced apoptosis by LL-37 upregulation of COX-2 (2). Additionally, intestinal epithelial cell cultures are protected from TRAIL-mediated apoptosis when preincubated with LL-37 (36). Other cell types are more susceptible to proapoptotic effects of moderate doses of LL-37, inducing primary airway epithelial cells and osteoblasts (7). LL-37 levels are elevated in psoriatic skin (53), and significant interest regarding the role of this peptide in the pathogenesis of this disease has been evident. For a comprehensive review of the role of LL-37 in psoriasis pathogenesis, please see Reinholz et al. (54). Psoriasis is characterized by skin inflammation, keratinocyte proliferation, enhanced type I IFN signatures, and overexpression of LL-37. Importantly, the presence of LL-37 in this disorder may contribute to disease pathogenesis. LL-37/DNA complexes generate stable ligands that may promote loss of tolerance and TLR9 stimulation in psoriatic dermal pDCs. This results in type I IFN upregulation and further inflammatory pathway activation (3). Furthermore, LL-37 has antiapoptotic effects on keratinocytes, possibly contributing to the increased cellular proliferation present in this disorder (2). Cytosolic dsDNA can also stimulate activation and release of IL-1β in psoriasis via activation of the AIM2 inflammasome (55). However, when delivered to the cytoplasm following complexing with LL-37, cytosolic DNA does not enhance IL-1β production or inflammasome activation, suggesting that LL-37 protects keratinocytes from dsDNA-mediated AIM2 inflammasome activation (55). Thus, the presence of elevated levels of LL-37 in psoriatic skin may shift the balance away from the “classical” inflammatory mediators (such as IL-1β) and instead drive a pathology driven by type I IFN responses. Research into the role of LL-37 in psoriasis pathogenesis is ongoing. SLE is a heterogeneous systemic syndrome that can lead to severe organ manifestations driven by immune complex deposition and inflammation. The etiology of SLE remains elusive, but type I IFN pathways appear to be important contributors to disease development and severity (56). Recent evidence indicates that SLE neutrophils are primed to externalize DNA and other immunostimulatory molecules by enhanced synthesis and impaired degradation of neutrophil extracellular traps (NETs) (57–59). In this regard, an important role for LL-37 in stabilizing immune complexes generated through NETs has been described in SLE patients (4). SLE-derived NETs from both normal density and low-density granulocytes externalize significant amounts of LL-37 (58, 60). This peptide protects NET-derived DNA from degradation (4). Coupled with anti-dsDNA Abs, a hallmark of SLE, these circulating immune complexes of Ab, DNA, and LL-37 are able to stimulate TLR9 in pDCs, resulting in type I IFN production. Furthermore, SLE patients demonstrate autoantibodies to LL-37 contributing to immune complex formation (4). These autoantibodies are able to induce NETs, thus perpetuating an inflammatory cycle and providing more NET material to stimulate type I IFN production (4). Also potentially contributing to SLE pathogenesis is the proinflammatory effects of LL-37 on macrophages. Recombinant or NET-derived LL-37 stimulates inflammasome activation, resulting in IL-1β and IL-18 production (5). IL-18 is elevated in SLE patients and correlates with disease activity and markers of cardiovascular disease (61, 62). Inflammasome activation in response to LL-37 is enhanced in M1 macrophages derived from SLE patients, resulting in elevated production of IL-18, which can further induce NETosis and thus promote a vicious inflammatory cycle resulting in disease development or flare (5). In cutaneous lupus lesions, the upregulation of several antimicrobial peptides (AMPs), including LL-37, has been described (63). However, the effects of LL-37 upregulation in these lesions remain unknown. Some have speculated that these AMPs may provide a protective effect from cutaneous infection in cutaneous lupus erythematosus patients, but given the proinflammatory phenotype of LL-37 on macrophages (29), especially in SLE (5), further investigation into the role of LL-37 in lupus skin manifestations is warranted. Elevated expression of LL-37 and its activating protease have been described in RA patients (6, 64), and mechanistic studies are beginning to unravel the role of LL-37 in this disease. Periarticular osteopenia is a common finding among patients with RA (65), and LL-37 induces apoptosis of osteoblasts, which could contribute to reduced bone formation in arthritic joints (7). Furthermore, a recent report characterized elevated expression of LL-37 primarily in the osteoclasts and granulocytes within the human RA synovium (66). Using a pristane-induced arthritis model in rats, upregulation of rCRAMP, the rat ortholog of LL-37, was demonstrated in granulocytes, macrophages, and γδ T cells of synovial fluid. Importantly, transfer of pristane-exposed neutrophils induced arthritis, whereas type I IFN or autoantibody responses in control rats did not (66). This suggests that LL-37 may contribute to arthritis development, but further studies are needed to clarify its role. An association between periodontal disease and the development of RA has been suggested, and treatment of periodontal disease can lead to improvement in markers of RA disease activity (67). LL-37 levels are increased in gingival crevicular fluid of chronic periodontal disease patients (68) and may play a role in promotion of gingival inflammation by increasing PGE2 production (51). Given the numerous pathways through which LL-37 can affect inflammatory cell types, further investigation into the role of gingival LL-37 and RA manifestations should be examined. The risk of RA development is positively influenced by cigarette smoking, which is associated with development of anti-citrullinated protein Abs and correlates with disease activity (69). Cigarette smoke is able to induce upregulation of mCRAMP via NF-κB pathways, and recruitment of macrophages and neutrophils into the lung following smoke exposure was highly dependent on the presence of mCRAMP (8). Furthermore, cigarette smoke exposure enhances the enzymatic activity of peptidylarginine deiminase 2, resulting in enhanced citrullination of proteins (9), including LL-37 itself, which increases its chemotactic properties (70). Because neutrophils are prone to NETosis in RA patients and NETs are a source of citrullinated Ags in RA (71, 72), the role of LL-37, and its citrullinated form, in enhancing cigarette smoke–related RA risk factors should be explored. In addition to the diseases mentioned above, reports exist of potential roles for LL-37 in other autoimmune disorders. LL-37 may have a potentially protective role in the development of sarcoidosis, as transcript levels are repressed in more severe disease. This is ascribed to TNF-α effects, which negatively affect LL-37 expression in alveolar macrophages (73). Additionally, nasal secretions from patients with granulomatosis with polyangiitis (formerly known as Wegener’s granulomatosis) colonized with Staphylococcus aureus, a potentially pathogenic bacteria in this disease, show significantly elevated levels of LL-37 (74). However, whether the elevated levels of this peptide are proinflammatory or protective in this disease remains to be determined. Atherosclerosis is considered an inflammatory disease (75) in which innate immune pathways, including upregulation of type I IFNs, are activated in atherosclerotic plaques and contribute to disease development (76–79). A participation of LL-37 bound to immune complexes that promote type I IFN production and stimulate atherosclerosis development has been proposed (80). Transcription of LL-37 is elevated in human atherosclerotic aortas (81) and its association with neointima-associated macrophages has been demonstrated (82). Furthermore, proatherosclerotic Apoe−/− mice demonstrate elevated neutrophil-associated mCRAMP in the carotid arteries of mice fed high-fat chow. These mice lose mCRAMP staining and have substantial protection in plaque size and macrophage recruitment when crossed to mCRAMP−/− mice (10). This suggests that LL-37 plays an important role in recruitment of inflammatory cells to plaques as well as modulation of the plaque cytokine environment to promote atherosclerotic lesion development. In addition to plaque promotion, LL-37 also has effects on endothelial cells. LL-37 induces endothelial cell activation and upregulation of ICAM-1, which participates in inflammatory cell recruitment to plaque (11). Furthermore, although this response may be important for vasculogenesis and wound vascularization, it may be prothrombotic in the context of atherosclerotic lesions. Interestingly, when used to coat coronary stents, LL-37 prevented in-stent rethrombosis by promotion of the re-epithelialization of the stent, which limited neointimal hyperplasia (83). Thus, the effects of LL-37 on atherosclerosis are also likely dual in that it promotes atherosclerotic inflammation but may facilitate vascular healing. Because of their antimicrobial properties, AMPs have been a promising target for drug development as alternatives to systemic antibiotics (reviewed in Ref. 84). However, others have cautioned that exposure to manufactured peptides may induce microbial resistance to innate human defenses against microbial invasion (85). Indeed, various antibiotics with cathelicidin-like properties can promote microbial resistance to LL-37 (86). Given the rapidly evolving role of LL-37 in autoimmune diseases, this molecule could potentially serve as a target for immune modulation as well. Neutralization of TLR4 signaling has shown promise in diseases such as colitis, chronic pain, and sepsis (reviewed in Ref. 87). Given the effects of LL-37 on this receptor, it may have potential as a therapy in diseases impacted by TLR4 signaling. For diseases where LL-37 may promote TLR7 and TLR9 signaling, such as psoriasis and SLE, antagonism of this peptide may provide a therapeutic target. Because LL-37 is able to participate in immune complex formation (4), caution should be exercised when attempts to neutralize this peptide using Abs are considered. Furthermore, the consequences of blockade of this peptide on antimicrobial defenses will need to be carefully studied. The innate immune system is gaining attention for its contributions to autoimmune disease development. For LL-37, this peptide is produced in environments where it is prone to interact with microbes. Some of the functions of LL-37 are anti-inflammatory, particularly those involved in blocking Gram-negative signaling pathways through TLR4. However, in the context of the inflammatory response, this peptide may also provide proinflammatory signals that can propagate inflammation, stimulate type I IFN production, and result in induction of autoimmune diseases. Further research is needed to fully understand the big effects of this little peptide on immune system function so that potential therapeutic uses can be explored. This work was supported by National Institutes of Health Project Grants F032521 (to J.M.K.) and F033615 (to M.J.K.).
. 2004. APD: the antimicrobial peptide database. Nucleic Acids Res. 32: D590–D592.
. 2009. The human antimicrobial peptide LL-37 suppresses apoptosis in keratinocytes. J. Invest. Dermatol. 129: 937–944.
. 2007. Plasmacytoid dendritic cells sense self-DNA coupled with antimicrobial peptide. Nature 449: 564–569.
. 2011. Neutrophils activate plasmacytoid dendritic cells by releasing self-DNA-peptide complexes in systemic lupus erythematosus. Sci. Transl. Med. 3: 73ra19.
. 2013. Neutrophil extracellular trap-associated protein activation of the NLRP3 inflammasome is enhanced in lupus macrophages. J. Immunol. 190: 1217–1226.
. 2002. Antimicrobial peptides are expressed and produced in healthy and inflamed human synovial membranes. J. Pathol. 198: 369–377.
. 2013. The antimicrobial peptide LL-37 alters human osteoblast Ca2+ handling and induces Ca2+-independent apoptosis. J. Innate Immun. 5: 290–300.
. 2008. Smoking increases peptidylarginine deiminase 2 enzyme expression in human lungs and increases citrullination in BAL cells. Ann. Rheum. Dis. 67: 1488–1492.
. 2012. Lack of neutrophil-derived CRAMP reduces atherosclerosis in mice. Circ. Res. 110: 1052–1056.
. 2003. An angiogenic role for the human peptide antibiotic LL-37/hCAP-18. J. Clin. Invest. 111: 1665–1672.
. 1995. Human CAP18: a novel antimicrobial lipopolysaccharide-binding protein. Infect. Immun. 63: 1291–1297.
. 2006. Kallikrein-mediated proteolysis regulates the antimicrobial effects of cathelicidins in skin. FASEB J. 20: 2068–2080.
. 2001. Human cathelicidin, hCAP-18, is processed to the antimicrobial peptide LL-37 by extracellular cleavage with proteinase 3. Blood 97: 3951–3959.
. 1999. Structure and organization of the human antimicrobial peptide LL-37 in phospholipid membranes: relevance to the molecular basis for its non-cell-selective activity. Biochem. J. 341: 501–513.
. 2006. Interaction of the gelsolin-derived antibacterial PBP 10 peptide with lipid bilayers and cell membranes. Antimicrob. Agents Chemother. 50: 2932–2940.
. 1998. Activities of LL-37, a cathelin-associated antimicrobial peptide of human neutrophils. Antimicrob. Agents Chemother. 42: 2206–2214.
. 2011. Transmembrane pores formed by human antimicrobial peptide LL-37. Biophys. J. 100: 1688–1696.
. 2013. Physiologically-relevant modes of membrane interactions by the human antimicrobial peptide, LL-37, revealed by SFG experiments. Sci. Rep. 3: 1854.
. 2012. A comprehensive summary of LL-37, the factotum human cathelicidin peptide. Cell. Immunol. 280: 22–35.
. 2008. The vitamin D pathway: a new target for control of the skin’s immune response? Exp. Dermatol. 17: 633–639.
. 2011. Regulation of cathelicidin antimicrobial peptide expression by an endoplasmic reticulum (ER) stress signaling, vitamin D receptor-independent pathway. J. Biol. Chem. 286: 34121–34130.
. 2007. Cutting edge: vitamin D-mediated human antimicrobial activity against Mycobacterium tuberculosis is dependent on the induction of cathelicidin. J. Immunol. 179: 2060–2063.
. 2001. Innate antimicrobial peptide protects the skin from invasive bacterial infection. Nature 414: 454–457.
. 2005. Cathelicidin mediates innate intestinal defense against colonization with epithelial adherent bacterial pathogens. J. Immunol. 174: 4901–4907.
. 2006. The antimicrobial peptide cathelicidin protects the urinary tract against invasive bacterial infection. Nat. Med. 12: 636–641.
. 2013. The antimicrobial peptide cathelicidin modulates Clostridium difficile-associated colitis and toxin A-mediated enteritis in mice. Gut 62: 1295–1305.
. 2011. Antiviral activity and increased host defense against influenza infection elicited by the human cathelicidin LL-37. PLoS ONE 6: e25333.
. 2010. LL-37 directs macrophage differentiation toward macrophages with a proinflammatory signature. J. Immunol. 185: 1442–1449.
. 2007. Host defense peptide LL-37, in synergy with inflammatory mediator IL-1β, augments immune responses by multiple pathways. J. Immunol. 179: 7684–7691.
. 2006. The human cationic host defense peptide LL-37 mediates contrasting effects on apoptotic pathways in different primary cells of the innate immune system. J. Leukoc. Biol. 80: 509–520.
. 2013. Human antimicrobial peptide LL-37 modulates proinflammatory responses induced by cytokine milieus and double-stranded RNA in human keratinocytes. Biochem. Biophys. Res. Commun. 433: 532–537.
. 2006. Human cathelicidin LL-37 is a chemoattractant for eosinophils and neutrophils that acts via formyl-peptide receptors. Int. Arch. Allergy Immunol. 140: 103–112.
. 2005. Induction of keratinocyte migration via transactivation of the epidermal growth factor receptor by the antimicrobial peptide LL-37. J. Immunol. 175: 4662–4668.
. 2002. The human antimicrobial peptide LL-37 is a multifunctional modulator of innate immune responses. J. Immunol. 169: 3883–3891.
. 2009. Effects of the cathelicidin LL-37 on intestinal epithelial barrier integrity. Regul. Pept. 156: 104–117.
. 2012. Associations between TLR polymorphisms and systemic lupus erythematosus: a systematic review and meta-analysis. Clin. Exp. Rheumatol. 30: 262–265.
. 2006. Endotoxin (lipopolysaccharide) neutralization by innate immunity host-defense peptides. Peptide properties and plausible modes of action. J. Biol. Chem. 281: 1636–1643.
. 2007. Cathelicidin antimicrobial peptides block dendritic cell TLR4 activation and allergic contact sensitization. J. Immunol. 178: 1829–1834.
. 2011. Host defense peptide LL-37 selectively reduces proinflammatory macrophage responses. J. Immunol. 186: 5497–5505.
. 2004. A novel P2X7 receptor activator, the human cathelicidin-derived peptide LL37, induces IL-1β processing and release. J. Immunol. 172: 4987–4994.
. 2009. Differing effects of exogenous or endogenous cathelicidin on macrophage Toll-like receptor signaling. Immunol. Cell Biol. 87: 496–500.
. 2011. LL37 and cationic peptides enhance TLR3 signaling by viral double-stranded RNAs. PLoS ONE 6: e26632.
. 2012. Signaling pathways mediating chemokine induction in keratinocytes by cathelicidin LL-37 and flagellin. J. Innate Immun. 4: 377–386.
. 2006. Type I interferons in host defense. Immunity 25: 373–381.
. 2013. The interferon signature in autoimmune diseases. Curr. Opin. Rheumatol. 25: 248–253.
. 2013. Molecular basis of DNA recognition in the immune system. J. Immunol. 190: 1911–1918.
. 2010. Dual functions of the human antimicrobial peptide LL-37: target membrane perturbation and host cell cargo delivery. Biochim. Biophys. Acta 1798: 2201–2208.
. 2012. Cytosolic sensing of extracellular self-DNA transported into monocytes by the antimicrobial peptide LL37. Blood 120: 3699–3707.
. 2013. Involvement of the P2X7 purinergic receptor and c-Jun N-terminal and extracellular signal-regulated kinases in cyclooxygenase-2 and prostaglandin E2 induction by LL-37. J. Innate Immun. 5: 72–83.
. 2012. Identification of the cathelicidin peptide LL-37 as agonist for the type I insulin-like growth factor receptor. Oncogene 31: 352–365.
. 2002. Endogenous antimicrobial peptides and skin infections in atopic dermatitis. N. Engl. J. Med. 347: 1151–1160.
. 2012. Cathelicidin LL-37: an antimicrobial peptide with a role in inflammatory skin disease. Ann. Dermatol. 24: 126–135.
. 2011. Cytosolic DNA triggers inflammasome activation in keratinocytes in psoriatic lesions. Sci. Transl. Med. 3: 82ra38.
. 2012. Complement, interferon and lupus. Curr. Opin. Immunol. 24: 665–670.
. 2010. Impairment of neutrophil extracellular trap degradation is associated with lupus nephritis. Proc. Natl. Acad. Sci. USA 107: 9813–9818.
. 2011. Netting neutrophils are major inducers of type I IFN production in pediatric systemic lupus erythematosus. Sci. Transl. Med. 3: 73ra20.
. 2011. Netting neutrophils induce endothelial damage, infiltrate tissues, and expose immunostimulatory molecules in systemic lupus erythematosus. J. Immunol. 187: 538–552.
. 2010. A distinct subset of proinflammatory neutrophils isolated from patients with systemic lupus erythematosus induces vascular damage and synthesizes type I IFNs. J. Immunol. 184: 3284–3297.
. 2011. Inflammasome activation of IL-18 results in endothelial progenitor cell dysfunction in systemic lupus erythematosus. J. Immunol. 187: 6143–6156.
. 2009. IL-18 activity in systemic lupus erythematosus. Ann. N. Y. Acad. Sci. 1173: 301–309.
. 2011. Expression of antimicrobial peptides in different subtypes of cutaneous lupus erythematosus. J. Am. Acad. Dermatol. 65: 125–133.
. 2008. The membrane proteinase 3 expression on neutrophils was downregulated after treatment with infliximab in patients with rheumatoid arthritis. Clin. Appl. Thromb. Hemost. 14: 186–192. 2012. Bone loss in rheumatoid arthritis: systemic, periarticular, and focal. Curr. Rheumatol. Rep. 14: 231–237.
. 2013. The cathelicidins LL-37 and rCRAMP are associated with pathogenic events of arthritis in humans and rats. Ann. Rheum. Dis. 72: 1239–1248.
. 2013. Periodontal disease and rheumatoid arthritis: a systematic review. J. Dent. Res. 92: 399–408.
. 2009. Gingival crevicular fluid levels of cathelicidin LL-37 and interleukin-18 in patients with chronic periodontitis. J. Periodontol. 80: 969–976. 2000. The effect of smoking on clinical, laboratory, and radiographic status in rheumatoid arthritis. J. Rheumatol. 27: 630–637.
. 2012. Peptidylarginine deiminases present in the airways during tobacco smoking and inflammation can citrullinate the host defense peptide LL-37, resulting in altered activities. Am. J. Respir. Cell Mol. Biol. 46: 240–248.
. 2013. NETs are a source of citrullinated autoantigens and stimulate inflammatory responses in rheumatoid arthritis. Sci. Transl. Med. 5: 178ra140.
. 2012. Alveolar macrophage cathelicidin deficiency in severe sarcoidosis. J. Innate Immun. 4: 569–578.
. 2011. Antimicrobial peptides in nasal secretion and mucosa with respect to S. aureus colonisation in Wegener’s granulomatosis. Clin. Exp. Rheumatol. 29(1, Suppl. 64): S49–S56. 2005. Inflammation, atherosclerosis, and coronary artery disease. N. Engl. J. Med. 352: 1685–1695.
. 2009. Type I interferon signatures are associated with vascular risk and atherosclerosis in systemic lupus erythematosus. Arthritis Rheum. 59(Suppl. ): S582.
. 2012. Plasmacytoid dendritic cells in atherosclerosis. Front. Physiol. 3: 230.
. 2006. Pathogen-sensing plasmacytoid dendritic cells stimulate cytotoxic T-cell function in the atherosclerotic plaque through interferon-α. Circulation 114: 2482–2489.
. 2012. Caspase-1 deficiency decreases atherosclerosis in apolipoprotein E-null mice. Can. J. Cardiol. 28: 222–229.
. 2012. Auto-antigenic protein-DNA complexes stimulate plasmacytoid dendritic cells to promote atherosclerosis. Circulation 125: 1673–1683.
. 2006. Involvement of the antimicrobial peptide LL-37 in human atherosclerosis. Arterioscler. Thromb. Vasc. Biol. 26: 1551–1557.
. 2006. Human antimicrobial peptide LL-37 is present in atherosclerotic plaques and induces death of vascular smooth muscle cells: a laboratory study. BMC Cardiovasc. Disord. 6: 49.
. 2011. Neutrophil-derived cathelicidin protects from neointimal hyperplasia. Sci. Transl. Med. 3: 103ra198.
. 2008. Using antimicrobial host defense peptides as anti-infective and immunomodulatory agents. Expert Rev. Anti Infect. Ther. 6: 887–895.
. 2012. Therapeutic antimicrobial peptides may compromise natural immunity. Biol. Lett. 8: 416–418.
. 2013. Clinical use of colistin induces cross-resistance to host antimicrobials in Acinetobacter baumannii. mBio 4: e00021-13.
. 2010. Targeting Toll-like receptors: emerging therapeutics? Nat. Rev. Drug Discov. 9: 293–307.